On the banks of Connecticut’s historic Mystic River, Mystic Seaport is the nation’s leading maritime museum. Founded in 1929, it is home to four vessels with National Historic Landmark status. Visitors can explore more than 19 acres along the river, including a re-created 19th-century seafaring village and a working preservation shipyard. A visit to Mystic Seaport is an interactive experience, where you can learn about 19th-century New England’s seafaring heritage and maritime history through on-site historians, storytellers, and craftspeople. Climb aboard historic vessels including the wooden whaleship Charles W. Morgan, witness shipbuilding in action in the working shipyard, duck inside the cooperage, or explore the stars (and the art of celestial navigation) at the Treworgy Planetarium. The museum’s gardens showcase plants from the habitats of the Mystic River. 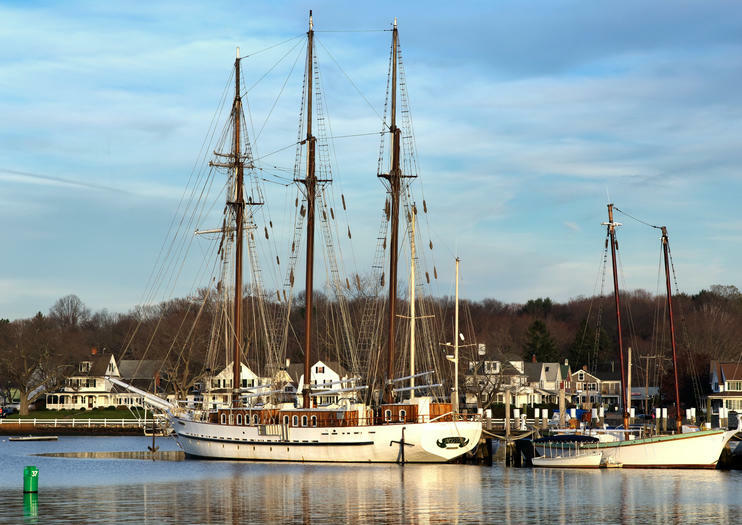 The Mystic Seaport is a must-see for history buffs and families. Don’t forget to bring sunscreen, sunglasses, and a hat, as many of the museum’s exhibits are outdoors. Photography is permitted at Mystic Seaport, but leave tripods, monopods, and drones behind. About a third of the museum’s buildings have wheelchair-accessible entrances. Most trails are stable and firm, even if unpaved. Mystic Seaport is located in the town of Mystic, located 10 miles (16 kilometers) east of New London. The easiest way to get there is by car; there is free parking across the street from both the north and south entrances. Mystic Seaport is open daily throughout the year, with limited hours and operation during January and February. The best weather—and more sizable crowds—arrives in June, July, and August. If you’re in the area to visit Mystic Seaport, set aside some time to see some of the area’s other notable attractions. Traveling families can spend an afternoon at the kid-approved Mystic Aquarium, while the historic downtown area offers plenty of shopping and dining opportunities. Browse the rotating exhibits at the Mystic Museum of Art, or dive deeper into the region’s history at the Denison Homestead Museum. Hours: Open daily from 9am to 5pm. Limited hours in January and February. Explore America’s maritime history with admission to Mystic Seaport, and spend the day in a recreated 1870’s seafaring village. Meet ship smiths, coopers, and riggers, climb aboard historic tall ships, and step back in time at a series of constantly rotating maritime galleries. Admission to Mystic Seaport includes full access to the 19-acre (7.7-ha) campus and three tall ships, with parking onsite.